Libby is a 7 month old mix breed whose owners contacted me for dog training in Carmel NY. She has a timid side that makes her unsure of new people and new environments. Libby is also difficult to walk on a leash, which prevents her owners from taking her out. As a result, she developed a lot of pent up energy that she releases by destroying items in the home (ex. chewing on the table, tearing up sofa pillows, etc.). We are going to solve her leash walking struggles in one training session, so her owners can easily take her out for daily walks. 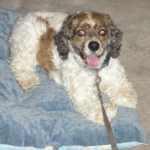 Both Libby and her owners will be able to enjoy a comfortable and stress-free walk together. From there, we are taking Libby through my obedience training program. This will improve Libby’s confidence in people/new settings because she is confident in her owners ability to communicate to her and keep her safe in uncertain situations. 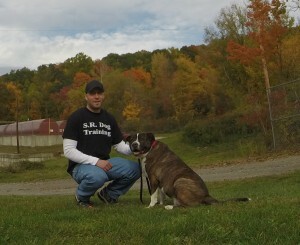 I am very proud of Libby and her owner’s first obedience training and dog training session in Carmel NY. Jack is a Cocker Spaniel who had several undesirable and potentially dangerous behaviors. Jack growled at his owner’s grandson, would become overexcited and jump on guests as they entered the home. These are not uncommon issues, but ones that need to be handled with the right training system. Most trainers do not know how to handle cases like this, and that’s why owners don’t see the results they are looking for and need. We started off by helping to elevate her grandson’s status within the family structure (from the dog’s point of view). A few key changes on our part can make a significant impact on our dog’s behavior. Structured walks, clear rules/boundaries, and reliable obedience commands lead to successful dog training. The principles I use for dog training in Carmel NY are the same principles I use with dog owners across the world. Successful principles do not change. We taught Jack a reliable “Place” command so we could direct him to a specific location to lie down when visitors came to the door. This gave Jack an alternative and more appropriate way to act when guests entered the home. Instead of jumping, barking, and being overexcited; he can lay down relaxed until the guests are settled – then he could meet/interact safely and politely. Learn more about the 5 Obedience Commands to Make Your Life Easier. Regardless of breed or age, the important concept is to utilize safe, fair, and effective methods of dog training. 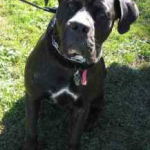 Pippa is a 13 month old Cane Corso who is 106lbs. Her owner wanted Pippa to be off leash obedience trained, so she will be reliable in the presence of a high level of distractions. I am also training Pippa to pass her Canine Good Citizen (CGC) test so she will be an exceptional representation of her breed. The standards for this exam are rigorous, and require the dog to be well-rounded in their training. We are socializing her with dog/human interactions, and developing reliability with her commands in different settings with different distractions. Having a properly socialized and obedient dog is something that is possible for every dog owner. There is no need for you to continue to live stressed and frustrated with your dog’s behavior issues and ignoring your commands. Whether you are looking for dog training in Carmel NY, pass a Canine Good Citizen exam, puppy training, or obedience training – make sure to use a safe, simple, and effective training system to help you achieve your goals.